So here's the how to on removing the fuel pump. This was done on a 1999 V6 but the procedure should be the same on 1.8Ts. 1). Pull fuse #28 from the fuse panel on the drivers side of the dash. This is the fuel pump fuse, double check this fuse number in you're owners manual. Then start the car and let it run till it stalls. You're removing as much fuel from the lines as possible this way. Also open the gas cap to depressurize the tank, especially if it's been sitting in the sun and may be hot or was run recently. 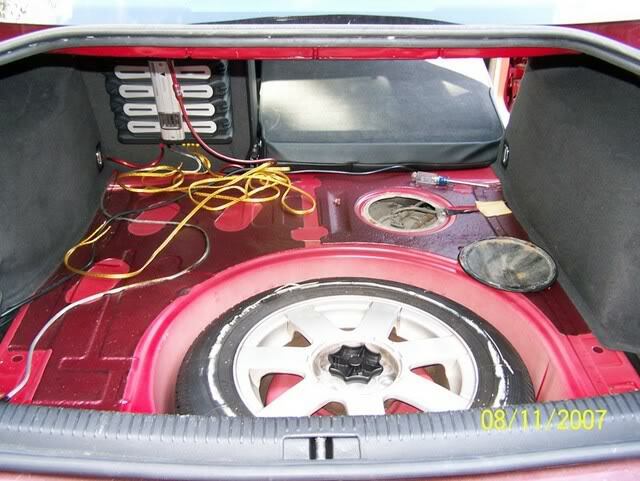 2) Pull the carpet out from the trunk to get access to the fuel pump access panel which is behind the passenger side rear seat. 3) Open the access panel be removing the three Phillips screws. You'll be able reach it better from the back seat. 4) Disconnect the electrical connector from the top of the sending unit. You may have to use a small flat head screw driver to pry open the snap connector a little. Be careful not to break the plastic. 5) Using a small flat head screwdriver pry off the one use clamps from the fuel lines, then slowly remove the fuel lines from the sending unit. Have towels hands as there may be fuel still in the lines that are under pressure so it can come out with a little force. This was especially the case with the line to the left of the electrical connector. It may be a good idea to start wearing protective eye glasses at this point. I don't recommend wearing latex or nitril gloves as they didn't hold up well to exposure to gasoline. 6) Next use a hammer and a large flat head screw driver to loosen the locking "nut" around the sending unit. It unscrews counter-clockwise. 7) Once the nut is removed pull the sending unit up from the tank. 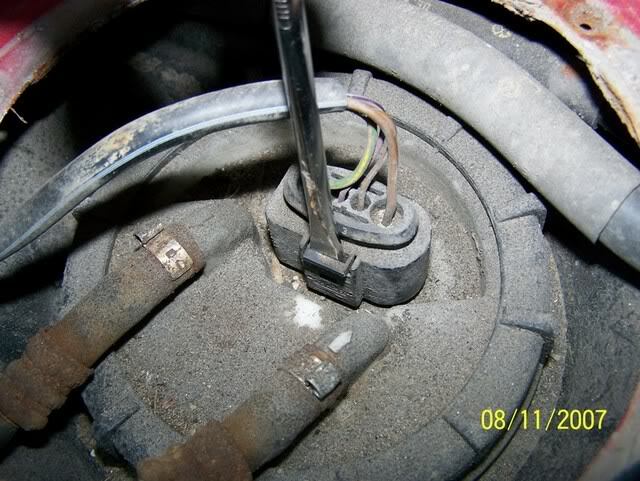 8) Disconnect the electrical connectors from the bottom of the sending unit as well as the fuel lines. The electrical connector and fuel line with the black ends will be reused with the new pump so be careful not to damage them. The other fuel line and electrical connector are included with the new pump that I sent to you. 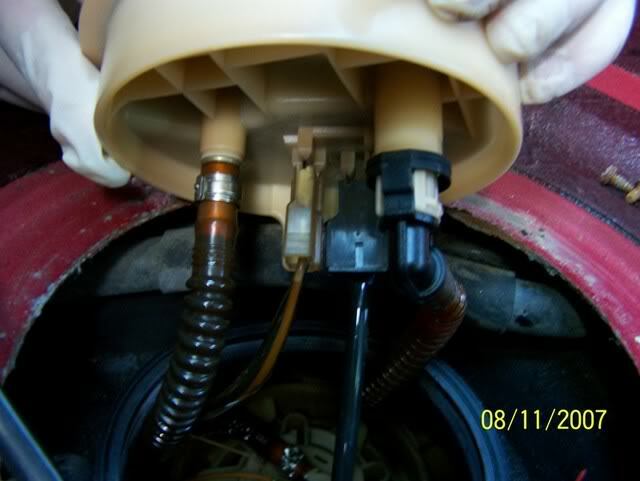 You'll find it easier to remove the fuel pump later if you completely remove the sending unit so it's good to just disconnect them now. 9) With the sending unit out of the way you're ready to remove the fuel pump. You do this by reaching down into the tank and twisting the fuel pump counter-clockwise about 15 degrees to unlock it from the housing. You have to use a bit of force to do this, so be cautious that you don't accidentally break the housing that the pump sits in. Look at the new pump to get an idea of how it's locked in place as well as what is good to grab a hold of. 10) Once you have the pump loose just pull it out of the tank. It's a tight fit, to make it a little easier to get it out push the fuel line and electrical connector with the black ends down in to the tank to get them out of the way. They are connected within the tank so they won't sink or float away. 11) With the fuel pump out of the way you're ready to put the new pump in. Just follow the steps above in reverse. 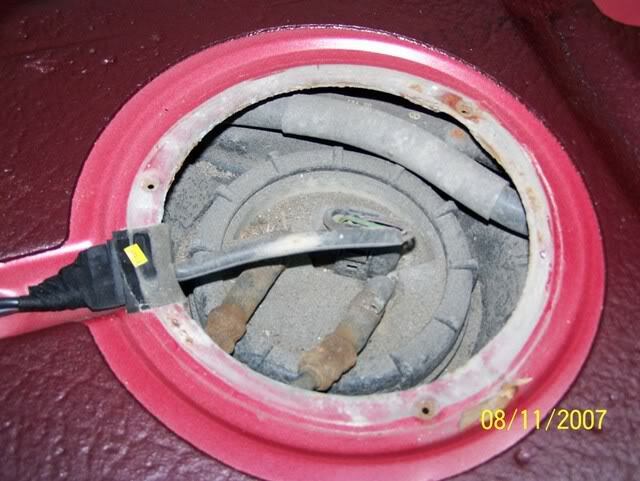 Make sure you have all of the electrical connectors secure and use either zip ties or screw type clamps on the fuel lines. The toughest part is getting the rubber seal around the sending unit to sit properly. You'll know that it is correct when you can fully push the unit down flush into the tank. You have to put the locking nut on before you reconnect the fuel lines. 12) Once everything is back in place you're ready to start the car back up. Leave the access panel off just in case you need to get back in there. Put the fuel pump fuse back in to the fuse panel and also the gas cap back on. Prime the fuel lines to the engine by turning the key to the on position without starting the car a couple of times. When you first turn it over it'll cycle for a while since you cleared the lines earlier. If it doesn't start right away, turn the key off, wait a few seconds and try again. It should start right up. That's it. Not too bad, just take your time. If you have someone to give you a hand it's nice to have a second set of hands available. I'd like to thank Pson for lending me a hand with this job.